He is son of Jaffal , son of Mousa son of Tarabieh , son of Abee Nawfal Nader , son of Abee Nader Khazen , son of Abee Saker Ibrahim , son of Shediaq Sarkis El Khazen. 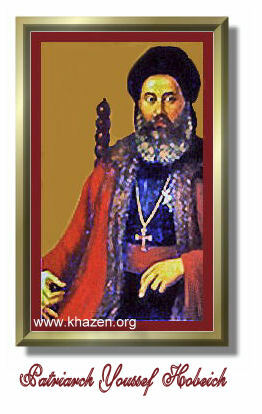 Born in 1756, Governor of Keserwan region 1808-1822. At the beginning of his term , he had excellent relations with Emir Bashir Shihab II (Prince of Mount Lebanon) who used to visit him more than once a year at his residence in Zouk Mikael , escorted by his entourage exceeding 500 persons with a similar number of horses , staying as guests of the Cheikh , for 3 days (According to Arab customs) and enjoying his warm, splendid hospitality . These relations worsened when Emir Bashir's brother, Emir Hasan tried to cancel Cheikh Bishara's privileges on Keserwan. He was faced by fierce opposition from the Cheikh and the whole Khazen family , annulling this act with the help of Jeries (George) Baz. It worsened more when Emir Hasan put a silk scale in Jounieh violating Cheikh Bishara's rights . Advised by his close friend Cheikh Bashir Jumblat, the Cheikh went to Jounieh with some of his men , destroyed the scale and put it aside. He was very generous, lived extravagantly , prestigious , highly respected and appreciated by his community for his extreme generousity and recognition by the highest ranks of the state . It is also worth to note that he was extremely wealthy and nearly all of the Zouk was his own property. He also owned two thirds of the lands in Kfardebian and in addition he had property in Aintoura and most of the villages in Keserwan . In 1826, a year after his death , Emir Bashir Shihab II seized the opportunity and claimed himself owner of all Cheikh Bechara's properties including his house and its furniture , leaning on a false claim that he had no close relatives as direct heirs. In response, the Khazens denied this claim by proving that Cheikh Bechara had such close relatives having the right to inherit him. 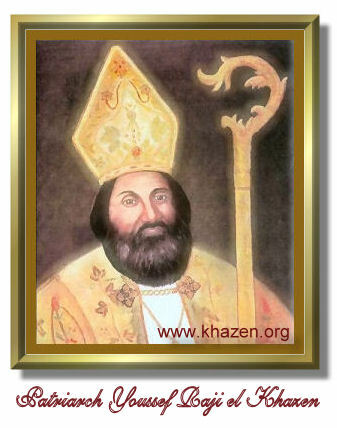 This problem was finally solved by a settlement with Emir Bashir after the interference of priest Youssef Raji El Khazen (later Patriarch Youssef Raji El Khazen 1845-1854) and Archbishop Antoine El Khazen, by paying the Emir 170,000 gold coins. Archbishop Antoine El Khazen to sell her late husband's property and pay the amount needed , according to the settlement. Wife of Cheikh Bishara Jaffal El Khazen , daughter of Sarda , son of Sherwan , son of Mousa , son of Tarabieh , son of Abee Nawfal Nader , son of Abee Saqer Ibrahim , son of Shediaq Sarkis El Khazen. She was gifted with astonishing beauty, lived in high standards of luxury and extravagance, a sole daughter of wealthy parents. Married, to Cheikh Bishara who was also extremely wealthy and prestigious as previously mentioned. Indeed perfect and lucky girl. No one could predict the disasters that would happen to someone like her in a great part of her life. She was firstly confronted by the tragic death of her two children, Jaffal and Clementine, having no children except them. And after a short while, her husbands death when she was in the middle age, doubling her sorrow and agony, ending with prince Bashir's claim on her husband's property. She received all these disasters with tremendous patience, without complaining, surrendering to God's will and accepting her destiny. 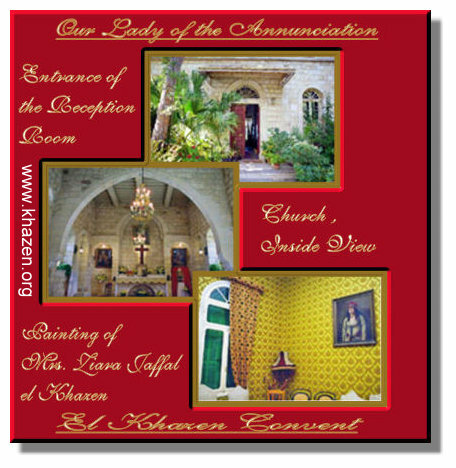 After having the amount needed to pay for the settlement with emir Bashir and giving the other heirs their share of her late husband's inheritance, she and her husband's sister, with their cousin, the priest Youssef Raji El Khazen, decided to entail all the property left, to the "Our Lady of Annunciation Convent", where Sisters from the Order of Saint Francis Salasius and Sainte Jeanne De Chantale founded the convent. The order was also known as Sister of the Visit similar to the Sisters in Aintoura's Convent. 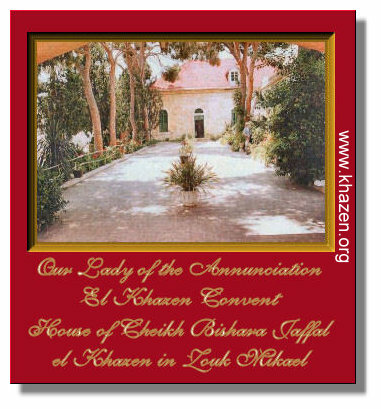 His Beatitude the Patriarch Youssef Houbeich hallowed the convent on the name of Our Lady of the Annunciation on January 1, 1829. After establishing the convent, she abandoned the way of life she used to have, resigned of governing the Zouk and Aintoura and devoted herself for serving and worshiping God. She lived for 33 years, life of austerity and asceticism. She died when approaching 80 at June 28, 1858.